Actually this is one of the first finished armies on unfinished armies. The last two units I wanted to paint are the hungarian Bofors and a second objective. After collecting hungarians for now three years I finished my mid war hungarians with the core troops for a Lorried Infantry company and Tank company. 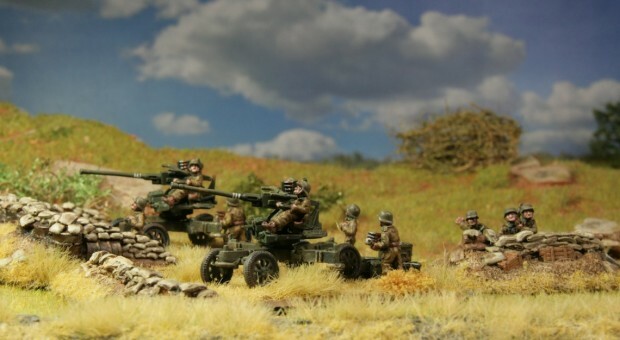 The hungarian Bofors for mid war need to get an head swap with the german or hungarian heads available from Battlefront. Meanwhile there are Bofor Anti Air Emplacements available, which have special rules for late war. Painting these models is very time intensive, since the guns have many peaces, and I painted ammo boxes, crews, gun carriages and guns separately. The hungarian Bofors seemed to be used without the gun shields. Battlefront wrote, that there were some shields which looked different from the british versions coming with the miniatures. In Flames of War the two guns with the command team are available for 50 points, which is very attractive from a army composition point of view. 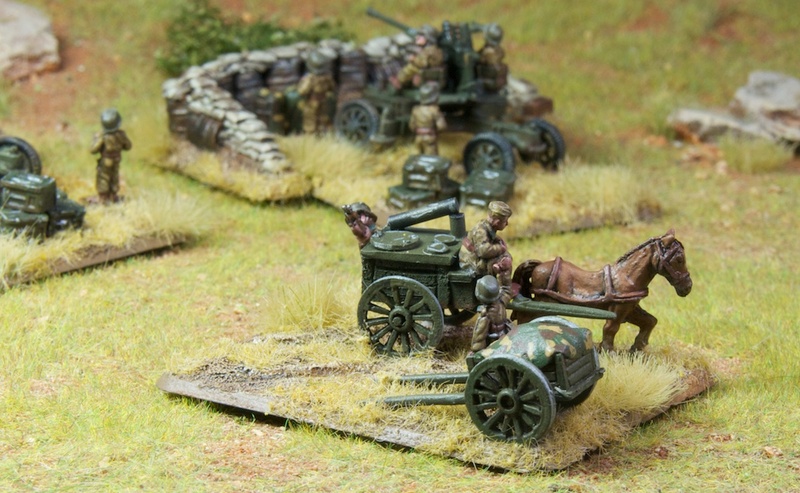 For the Bofors I painted a present from Ekimdj, who designed this excellent emplacements or dug in markers for FoW. 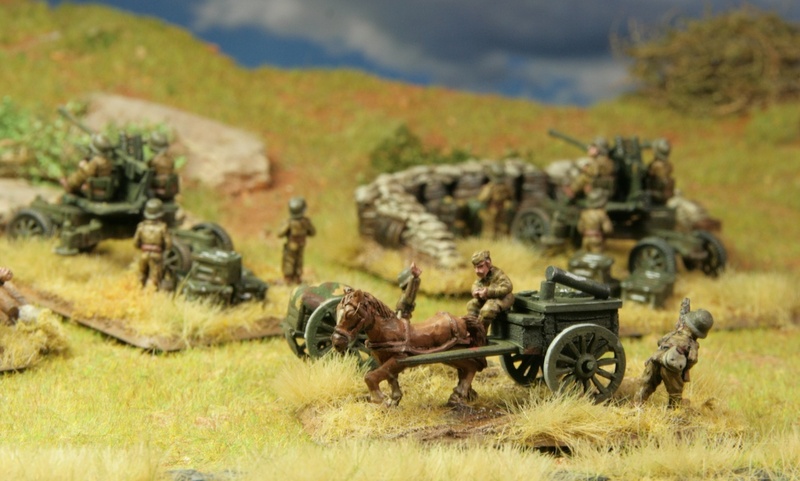 They were a fun to paint and show oil barrels, wooden boxes and sand backs with a very realistic look. I need to get more of them, since they add a lot of flavour to the scenery. When playing hungarians it´s very essential to dig in to cope with the overwhelming sovjet mass. Hence it´s very good to have markers for this special hungarian skill available. Hungarians may repeat their dig in roll. Another detail modeled by Ekimdj are the three oil barrels with the camo sheet on them. I painted them in the typical hungarian camo style. 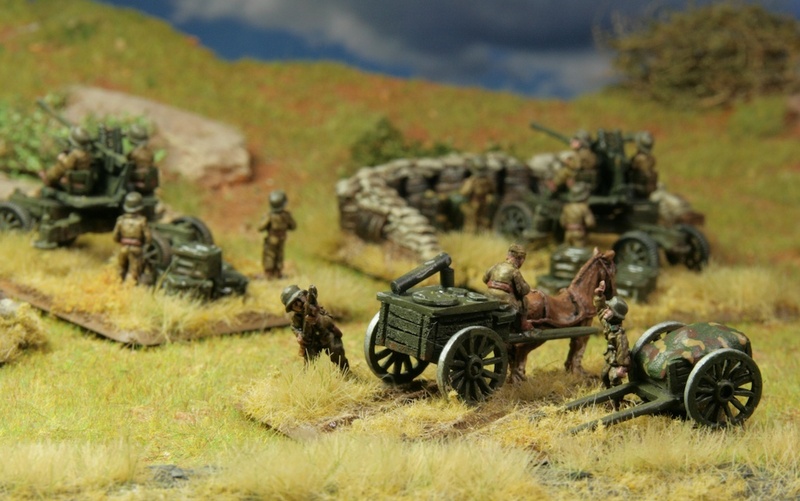 For a very long time I planned a hungarian field kitchen as my second objective for playing FoW. I wanted this because in german field kitchens are called Gulaschkanone which literally means Goulash cannon. Although the famous goulash soup is a national dish in hungary but the phrase Gulaschkanone is not used. I couldn´t resist and had to build this model by modifying the horse cart model by battlefront. I added a chimney, which could be folded down and some round devices on my scratch built cart construction. The original battlefront cart can be seen on the right. It is covered with a tarpaulin in hungarian three colour camouflage. 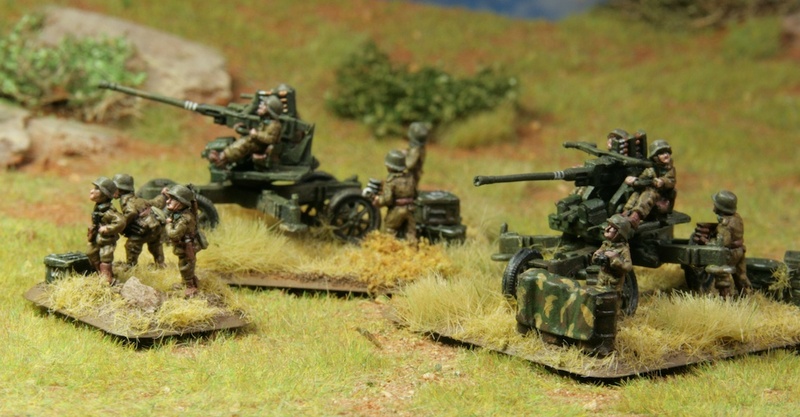 Since my mid war collection for infantry and tank company is finished, I painted some models, which are suitable for late war. 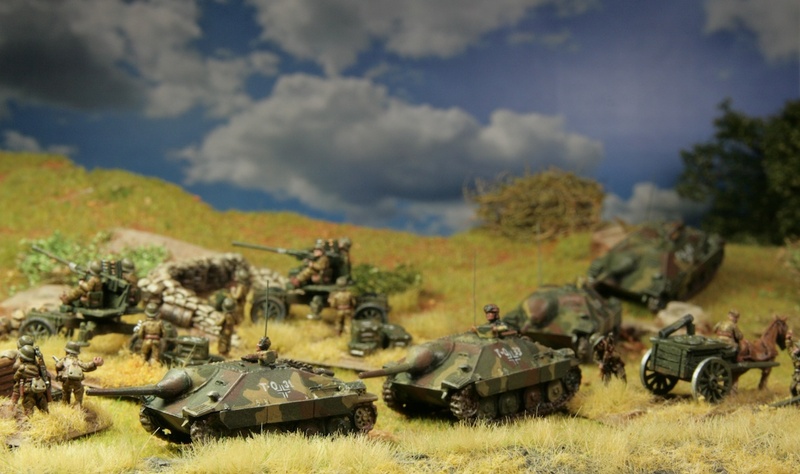 I always liked the german Hetzer from a design perspective and urgently wanted a unit of them. Since mid war is done, this is the first late war model in my collection. The king is dead, long live the king.